In fact, such Islamic seats of learning as Deoband, Qom and Al Azhar must unite in expressing their abhorrence of the atrocity in Nigeria. Silence will mean the Muslim world’s tacit approval of Boko Haram’s misogynist brigandage. THE news from Nigeria is blood-curdling. Shrouded initially in mystery, the kidnapping of almost 300 Nigerian girls last month has now been owned by Boko Haram, with its chief threatening ‘by Allah’ to sell those girls in slave markets. In a chilling demonstration of his intentions, in the name of Islam, Boko Haram chief Abubakr Shekau released an hour-long video that showed his hooded acolytes raising rifles and shouting ‘Allah-o-Akbar’ as Shekau flaunted his criminality to the Nigerian people by declaring, “I abducted your girls”. Describing the girls as “slaves”, he had no qualms about saying he would repeat his actions. Over 50 of the girls have managed to flee, two have died of snakebite, many have been forced to marry and some have been forcibly converted — all in the name of Islam. Last week, two explosions killed or injured more than 100 people, and police believe Boko Haram wanted to demonstrate its destructive power as Nigeria prepared to host the World Economic Forum. So far acts of terror by the Boko Haram militants and security crackdowns have led to over 1,500 deaths this year alone. But there is no indication yet that the Nigerian government has the political will to purposefully take on the extremists who have chosen murder and abduction as a strategy to advance their political aims for which they claim religious sanction. The Nigerian government has come under intense criticism at home for focusing all security measures on the WEF delegates and for ignoring the urgent task of recovering the girls. However, the issue doesn’t concern Nigeria alone. Seen against the background of religious militancy that has rocked Muslim (as well as non-Muslim) countries from Indonesia to Morocco, Boko Haram’s latest act of crime against humanity poses a question or two to the entire Muslim world, especially its intellectuals and ulema. Will the Muslim world stay quiet over this debasement of their religion and look away from the Nigerian people’s trauma? Girls are abducted from schools because Boko Haram says it opposes ‘Western’ education. That an education can be ‘Western or Eastern’ is a debatable issue, but even if ‘Western education’ is all that devilish, was the mass kidnapping of the girls the best way to register protest? The Muslim world now must speak up. Those who accuse the Western media of tarring all Muslims with the same brush now have an excellent chance of correcting this erroneous perception by denouncing Boko Haram’s evil deed in unequivocal terms and by dissociating the international Islamic community from such fiendish crimes. In fact, such Islamic seats of learning as Deoband, Qom and Al Azhar must unite in expressing their abhorrence of the atrocity in Nigeria. Silence will mean the Muslim world’s tacit approval of Boko Haram’s misogynist brigandage. 10 out of 10 THIS is WHAT Jamaat and Mullahs SHOULD be SAYING – Is this IMAM WRONG ? 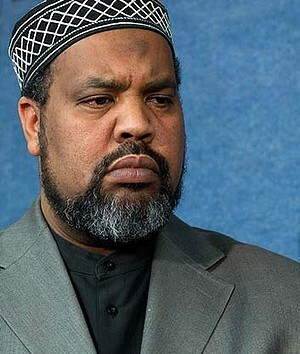 AS ANTI-AMERICAN violence spread across the Muslim world, the imam of one of America’s largest mosques urged his congregation to combat bigotry with education, and paid tribute to the US ambassador Chris Stevens killed on Tuesday in Benghazi, Libya. ”We should not fall into the trap of people who want to portray Muslims as violent people,” Imam Mohamed Magid told hundreds of followers at the Adams Centre, Virginia, adding that the Californian man who made a film insulting the prophet Muhammad was trying to provoke a clash of civilizations. The film was deeply offensive ”but we should not express our anger with violence and breaking things and taking innocent people’s lives”. Since the terrorist attacks of September 11, 2001, Muslim leaders in the US have found themselves in the delicate position of having to explain – to their congregations and to non-Muslims – that the actions of the few do not represent the beliefs of the many. As the violence escalated they underlined that message, not only for US Muslims but also for the rest of the Muslim world. The executive director of the Council on American-Islamic Relations, Nihad Awad, said that last week he had done dozens of interviews with media outlets in Muslim countries. On Friday he joined a debate with organisers of the Egypt protests on a satellite news channel there. ”I told them the producers of the film [Innocence of Muslims] are not known, they’re amateur, they’re not recognised in the industry, and that what they have produced has not been shown in American theatres,” he said, adding that the organisers had heard the film was being broadcast widely in the US. The council is also planning a public service announcement in Arabic condemning the violence and putting the film in context, he said. Imam Magid, orgiinally from Sudan, was working on an Arabic language article on the topic and planned to speak about it on Sudanese television yesterday. But Bahri Alireiza said not enough had been done in the US to condemn the film. ”I do believe in freedom of speech but this goes beyond that, it goes beyond the red line,” he said, adding that the US government should punish the filmmaker. “…..DEBKAfile was cited Best of the Web in 2002 by Forbes; selected Hot Site byUSAToday, profiled in the New York Observer (A Web Site With the Inside Dope on the Middle East), Time Magazine, Le Monde, Paris, Corriere della Sera, Milan, and The London Evening Standard, Wired News (DEBKA: Conflict’s Drudge Report? ), NEW MEDIA (For the real skinny on the Afghan story). In 2002, DEBKAfile was one of four finalists nominated by Webby (Oscar of the Web) for its annual award in the Internet news category. The BBC has placed DEBKAfile on its list of monitored sites. Bloomberg recommends DEBKAfile to its subscribers. All this RUBBISH sells USA and English Newspapers.